BACCHUS (http://www.bacchus-env.eu/) is a European FP7 Collaborative Project aiming at quantifying key processes and feedbacks that control aerosol–cloud interactions by combining advanced measurement techniques of cloud and aerosol properties with emphasis on ice nucleating particles and the ice phase in clouds with state-of-the-art numerical modelling. It investigates the importance of biogenic versus anthropogenic emissions for aerosol–cloud interactions in regions that are key regulators of Earth's climate (Amazonian rainforest) or are regarded as tipping elements in the climate system (Arctic). BACCHUS advances the understanding of biosphere aerosol–cloud–climate feedbacks that occur via emission and transformation of biogenic volatile organic compounds, primary biological aerosols, secondary organic aerosols, and dust. New fundamental understanding gained during BACCHUS will be incorporated into Earth system models through new or improved parameterizations of emissions, aerosol and cloud processes, and properties, which will lead to a reduction in the uncertainty of future climate projections. A unique database linking long-term observations and field campaign data of ice nucleating particles and observed cloud microphysical properties has been generated. The BACCHUS special issue will be simultaneously presented in the ACP, AMT, and GMD journals and is open for all submissions acknowledging the BACCHUS project. BACCHUS is a collaborative project of 21 partner institutions: ETH Zurich, University of Helsinki, Paul Scherrer Institute, Max Planck Society (MPI-M, MPI-C), University of Oxford, University of Oslo, Finnish Meteorological Institute, University of Leeds, University of Manchester, Leibniz Institute for Tropospheric Research, Goethe University Frankfurt, the University of Crete, National Research Council of Italy – Institute of Atmospheric Sciences and Climate, National University of Ireland Galway, Institute for Nuclear Research and Nuclear Energy, Hebrew University of Jerusalem, National Center for Scientific Research (France), Karlsruhe Institute of Technology, Cyprus Institute, Cyprus University of Technology, and University of Gothenburg. The project is funded by the European Union's Seventh Framework Programme (FP7/2007-2013) under grant agreement no. 603445. Unmanned Aerial Vehicles (UAV) bring new opportunities to study clouds, and better represent these in models. This analysis presents a comparison between direct observations in cloud from a UAV flight and results of a one-dimension model. The experiment is part of the European BACCHUS project, and took place in Cyprus, considered as a polluted environment. The study shows the importance of taking into account mixing air at cloud top to better match the model results with the UAV observations. Aerosols can affect the evolution of deep convective clouds by controlling the cloud droplet number concentration. We perform a detailed analysis of the pathways of such aerosol perturbations through the cloud microphysics in numerical model simulations. 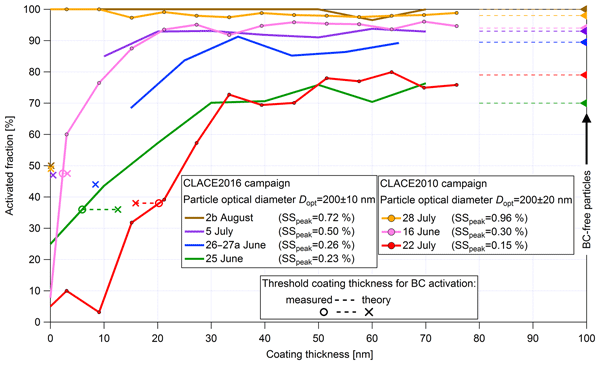 By focussing on individually tracked convective cells, we can reveal consistent changes to individual process rates, such as a lifting of freezing and riming, but also major differences between the three different microphysics schemes used. 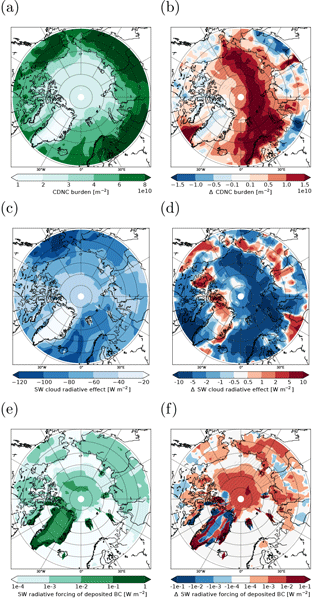 Low-level mixed-phase cloud (MPC) properties can be highly affected by the ambient aerosol concentration, especially in pristine environments as the Arctic. 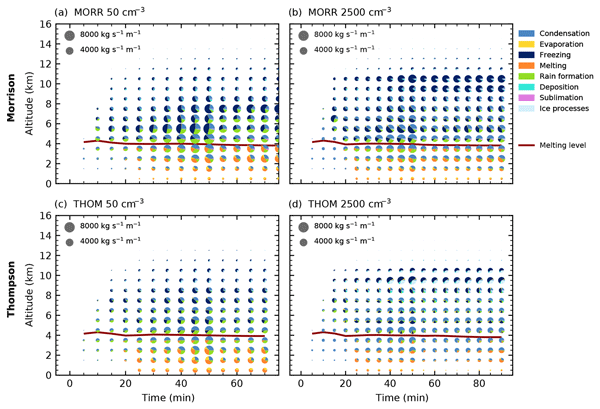 However, by employing high resolution model simulations we find that the effect of short-term aerosol perturbations on Arctic MPCs is efficiently attenuated with time. A substantial fraction of the aerosol is transported out of the boundary layer, which appears to inhibit any long-term impact of time-limited pollution events on Arctic MPCs. How important are future marine and shipping aerosol emissions in a warming Arctic summer and autumn? 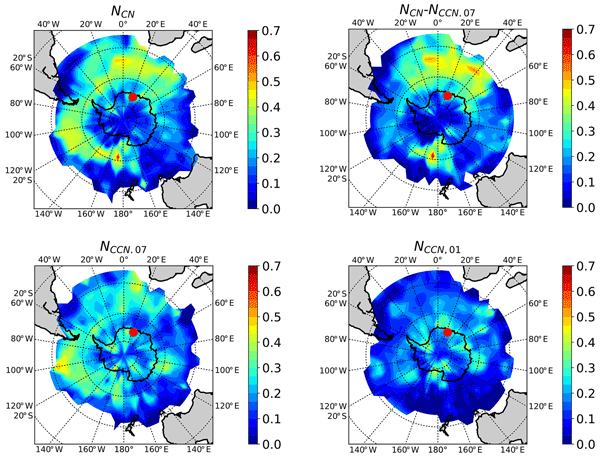 Aerosol emissions in Arctic summer and autumn are expected to increase in the future because of sea ice retreat. Using a global aerosol–climate model, we quantify the impact of increased aerosol emissions from the ocean and from Arctic shipping in the year 2050. 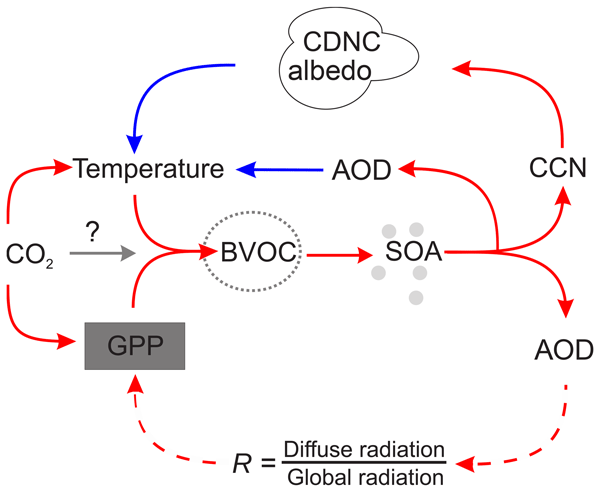 The influence on radiation of both aerosols and clouds is analysed. Mainly driven by changes in surface albedo, the cooling effect of marine aerosols and clouds will increase. Future ship emissions might have a small net cooling effect. 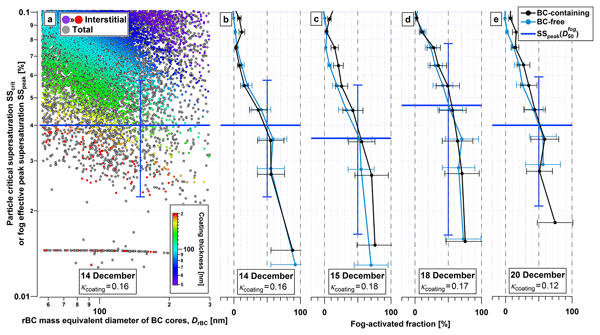 We report on ambient concentrations of ice nuclei, measured on the Cabo Verde islands. Concentrations are found to exponentially increase by 7 orders of magnitude from −5 to −38 °C. At each temperature, the frequency distribution of observed concentrations can be described by a lognormal distribution, typical for random dilution of substances during transport. Random dilution is found to account for larger fluctuations in IN concentration than seasonal changes and changes in air mass origin. The Arctic climate is changing much faster than other regions on Earth. Hence, it is necessary to investigate the processes that are liable for this phenomena and to document the current situation in the Arctic. Therefore, we measured the number and also the size of aerosol particles. It turned out that we captured the transition from the Arctic spring to the Arctic summer and that the according air masses show differences in particle properties. Also, the particles have a low water receptivity. 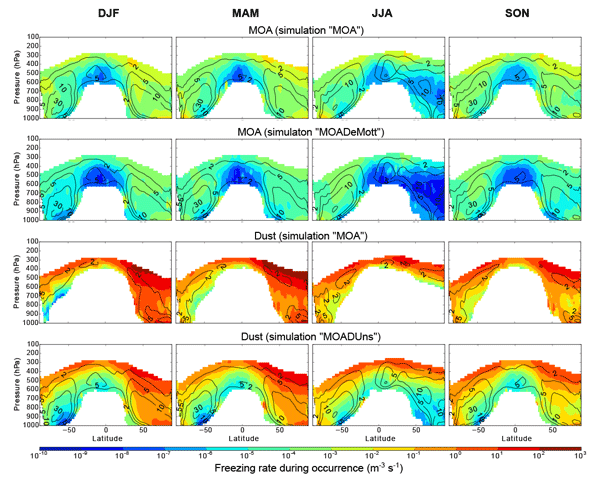 We quantify the importance in the atmosphere of different aerosol components to contribute to global ice-nucleating particles concentrations (INPs). The aim is to improve the way atmospheric cloud-ice processes are represented in climate models so they will be able to make better predictions in the future. We found that a kind of dust (K-feldspar), together with marine organic aerosols, can help to improve the representation of INPs and explain most of their observations. The effect of aerosol upon cloud properties is studied over the Baltic Sea region, which presents a distinct contrast of aerosol loading between the clean Fennoscandia and the polluted area of central–eastern Europe. Statistically significant positive values are found over the Baltic Sea and Fennoscandia, while negative values are found over central–eastern Europe, contradicting the theory of aerosol indirect effect on clouds. 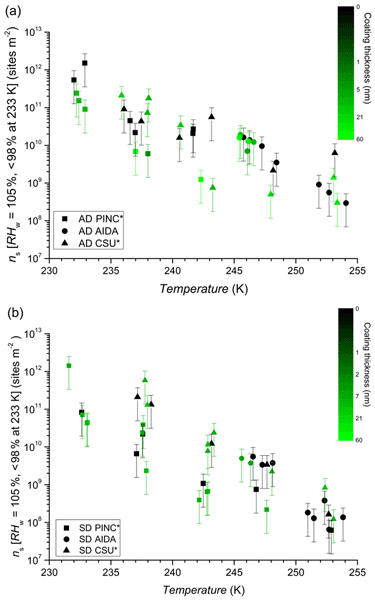 We compare the immersion freezing behavior of four airborne to 11 surface-collected dust samples to investigate the role of different minerals for atmospheric ice nucleation on desert dust. We find that present K-feldspars dominate at T > 253 K, while quartz does at colder temperatures, and surface-collected dust samples are not necessarily representative for airborne dust. For improved ice cloud prediction, modeling of quartz and feldspar emission and transport are key. This paper deals with impactor measurements performed in the summer 2012 during the EU project PEGASOS campaign in the Po Valley, at an urban and a rural site. The paper tries to disentangle the effects of weather anomalies (temporal and spatial) from those of diverse emissions (NH3) and chemical processes on the formation of secondary aerosols in the region, with special focus on nocturnal ammonium nitrate formation and its implications (aqueous formation of secondary organic aerosol). Knowing the variability of ice nucleating particles (INPs) helps determining their role in the formation of precipitation. Here we describe and predict the concentrations of INPs active at −8 °C in precipitation samples collected at Jungfraujoch (CH, 3580 m a.s.l.). A high abundance of these INPs can be expected whenever a coincidence of high wind speed and first precipitation from an air mass occurs. This expands the set of conditions where such INPs could affect the onset of precipitation. 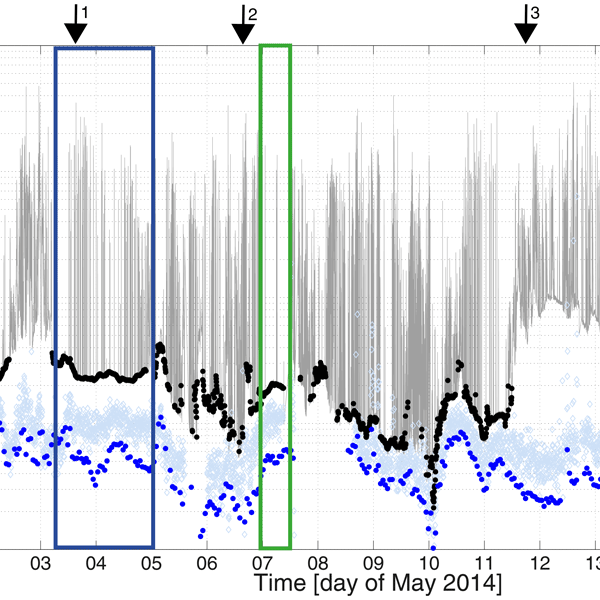 Turbulence, aerosol growth and microphysics of hydrometeors in clouds are intimately coupled. A new modelling approach was applied to quantify this linkage. We study the interaction in the cloud area under transient, high supersaturation conditions, using direct numerical simulations. Analysing the effect of aerosol dynamics on the turbulent kinetic energy and on vertical velocity, we conclude that the presence of aerosol has an effect on vertical motion and tends to reduce downward velocity. This study presents PEGASOS project data from field campaigns in the Po Valley, Italy and the Netherlands. Vertical profiles of aerosol hygroscopicity and chemical composition were investigated with airborne measurements on board a Zeppelin NT airship. A special focus was on the evolution of different mixing layers within the PBL as a function of daytime. 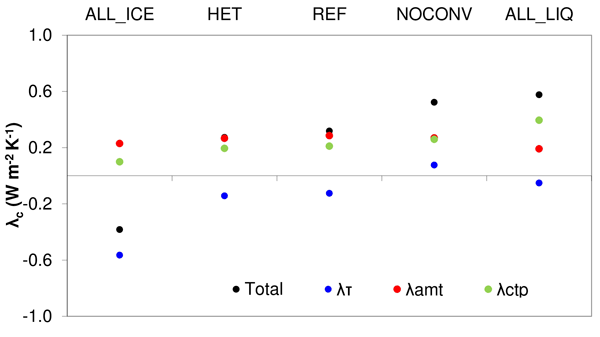 A closure study showed that variations in aerosol hygroscopicity can well be explained by the variations in chemical composition. A simple statistical model to predict the number of aerosols which activate to form cloud droplets in warm clouds has been established, based on regression analysis of data from the high-altitude site Jungfraujoch. It is found that cloud droplet formation at the Jungfraujoch is predominantly controlled by the number concentration of aerosol particles. 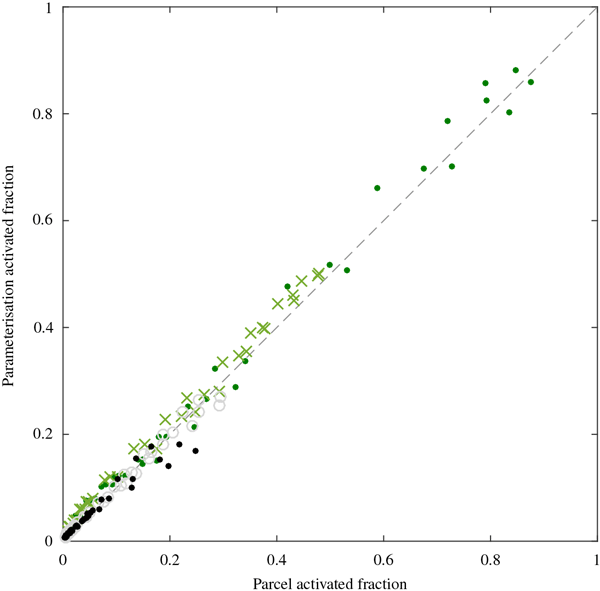 A statistical model based on only the number of particles larger than 80nm can explain 79 % of the observed variance in droplet numbers. Thanks for encouraging me to add the data from Hiranuma to the plot. We already did this, but at the time chose not to add it because the Hiranuma paper was at a very early stage. In any case because you mentioned it I found some issues with the figure caption in the old figure 8. The paper presents a technique to connect the vertical-velocity measurements of a Doppler lidar, a cloud radar and a wind profiler in order to record a coherent picture of vertical motions in the atmosphere. With such a combined dataset, thermal updrafts in the boundary layer, turbulent motion in cloud layers, the terminal fall velocity of precipitating particles and long-lasting wave motions in the free troposphere can be probed simultaneously.